Researchers develop world’s first biomimetic ciliary-motion microrobots. Biomimicry is an engineering technique that seeks sustainable solutions to human challenges by emulating nature’s time-tested patterns and strategies. The goal is to create products with processes which mirror the efficacy and slimline efficiency of life on earth. Now, researchers at DGIST develop ciliary microrobots, possessing high-propulsion efficiency in highly-viscous fluid environments in the human body by mimicking the movement of paramecia’s cilia. The team state that their ciliary microrobots for chemical and cell delivery, can be precisely controlled and move via paramecium-like ciliary motion. The opensource study is published in the journal Scientific Reports. Previous studies show that microrobots using propulsion mechanisms, such as spiral drive motion and progressive wave motion have been successfully realized and implemented. However, the development of microrobots that move utilizing ciliary motion has thus far been absent due to the difficulty of producing a microstructure with a large number of cilia as well as with asymmetrical drive. 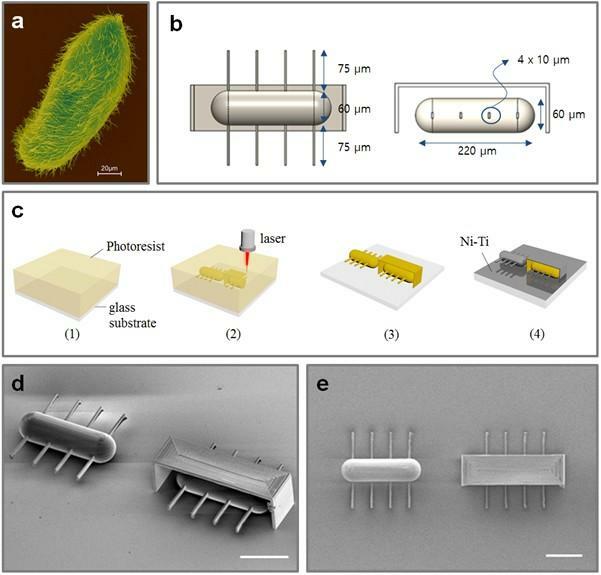 The current study succeeds in fabricating the world’s first ciliary microrobots via ultra-fine three-dimensional processing technology and asymmetric magnetic drive technology by applying microorganism’s ciliary movement. The current study produces a ciliary microrobot with nickel and titanium coating on top of photo-curable polymer material, using three-dimensional laser process technology and precise metal coating techniques. Results show that the speed and propulsion efficiency of their newly-developed microrobots are much higher than those of existing conventional microrobots, using the same magnetic actuation technology. Data findings show that the maximum speed of ciliary microrobots with a length of 220 micrometers and a height of 60 micrometers is 340 micrometers per second, thus the new microbots can move between 8.6 and 25.8 times faster than conventional microrobots moving under magnetic attraction drive. The team state that ciliary microrobots are expected to deliver higher amounts of chemicals and cells to target areas in the highly viscous body environment thanks to their ability to freely change direction and to move in an 80 micrometer-diameter sphere to the target point shown in the experiment using the magnetic field. The team surmise that with precise three-dimensional fabrication techniques and magnetic control technology, they have successfully developed microrobots mimicking cilia’s asymmetric reciprocation movement. For the future, the researchers state that they’ll continually strive to study microrobots which can efficiently move and operate in the human body, to be utilized in chemical and cell delivery, as well as in non-invasive surgery. a) This is a SEM image of microorganism, Paramecium, using ciliary stroke motion. b) Design layouts for artificial ciliary microrobots. c) Overall fabrication process for the ciliary microrobot using 3D laser lithography and metal sputtering. d) SEM image of ciliary stroke motion microrobots developed by Prof. Choi’s research team (3D view, scale bar = 100 μm). e) SEM image of ciliary stroke motion microrobots developed by Prof. Choi’s research team (top view, scale bar = 100 μm). Credit: DGIST.